Lumileds has introduced, with the name Luxeon UV U1, a new UV LED in a miniature SMD package that measures only 3.5 x 3.5 mm. Despite its tiny dimensions, at 25 °C, the LED achieves a radiated power of 700 mW at a current of 500 mA and more than 1300 mW at 1 A – more than double when compared to the previous generation Luxeon UV LEDs in the same package. 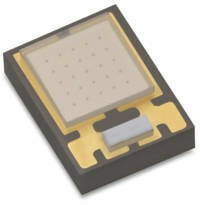 Lumileds has introduced, with the name Luxeon UV U1, a new UV LED in a miniature SMD package that measures only 3.5 x 3.5 mm. Despite its tiny dimensions, at 25 °C, the LED achieves a radiated power of 700 mW at a current of 500 mA and more than 1300 mW at 1 A – more than double when compared to the previous generation Luxeon UV LEDs in the same package. These values are valid for a wavelength of 395 nm. The LED is intended for UV-curing, counterfeit money detection, test and measurement equipment, and other violet/UVA applications and is available in wavelengths ranging from 380 nm to 420 nm. It is of a robust construction and doesn’t use materials that age, crack or discolor when subjected to UV light, and has no wire contacts which have the tendency to fail at the most inopportune moments. The LEDs can be mounted very close to each other, with a spacing of no more than 200 µm, for the purpose of obtaining very high system flux density. This is particularly interesting for the curing of resins or adhesives. With these LEDs it is possibly to build systems that in continuous use will have a lifetime of more than 20,000 hours.